The unveiling of the Audi e-tron is almost here. In just a few days, we’ll be live at the official reveal of the new e-tron SUV, Audi’s first-ever all-electric car. It seems that, despite its imminent release, Audi seems to still have test mules on the road, as one was just caught testing in New Jersey. One of our editors was in the northern part of New Jersey, ironically near BMW’s North American headquarters, when he saw this e-tron behind his car. The picture is from quite far away, so the clarity isn’t the best, but it’s undoubtedly the Audi e-tron. 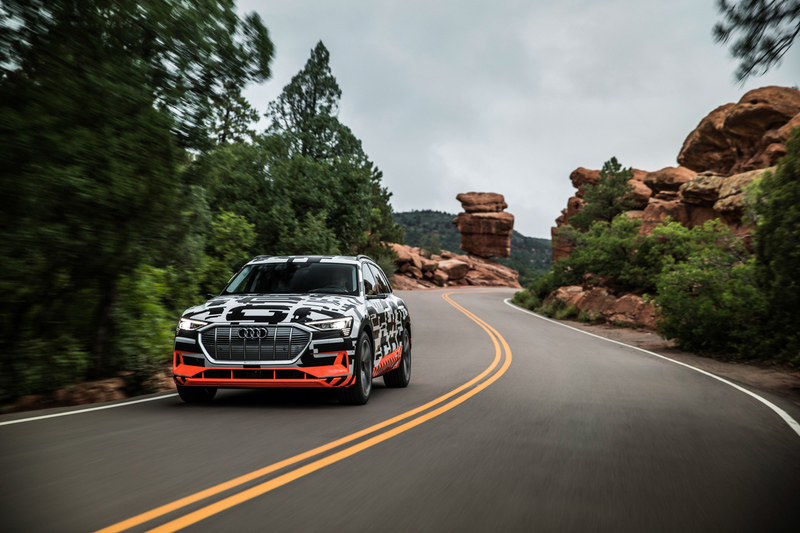 We can tell by its shape and its orange, white and black camouflage, which has only been seen on the e-tron thus far. What’s interesting is that it seems quite a bit smaller than we had anticipated. When seeing it next to other cars on the road, it really doesn’t seem very big. In fact, it looks so small it has me wondering if it’s actually something else, maybe a smaller electric SUV yet to be announced? Doubtful, but it still seems a bit small. The Audi e-tron is going to be a fully-electric SUV that packs a maximum range of 245 miles, making it perfectly suitable for an everyday car and could even work decently for long-ish trips. If you need to drive around 200 miles one way, you can likely do that with relative ease in the e-tron, charge it while you’re there and then drive back. That seems entirely possible, which is something that hasn’t exactly been possible on mainstream EVs until recently. Its two electric motors, one at each axle, combine to make 355 hp and 416 lb-ft of torque. That’s nowhere near the likes of the most powerful Teslas but we expect the e-tron to be quite a bit cheaper than those cars. Stay tuned, as we’ll be covering the reveal live Monday night, September 17.